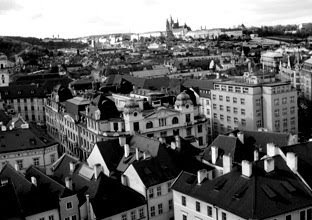 I don't have any photos of the Austrian/Czech countryside, so with my narrative, I'll show you pictures from the city of Prague. 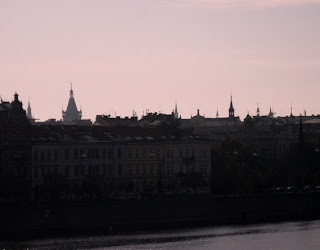 Friday morning came too early, we packed up our bags and got on the bus, enroute to Prague. The Austrian countryside consisted of fertile, green fields spotted with orange pumpkins, yellowish vineyards, and rolling hills dotted with tall, spiral-topped church steeples. Crossing the boarder into the Czech Republic, we drove through boarded-up passport checkpoints no longer in use. In between Austria and Czech is a short span of no-man's land containing garish casinos and odd, touristy attractions similar to Pedro's South of the Border on I-95. Travel into the Czech Republic is still undeveloped and uncommon, no autobahn, just a two lane road and the train systems aren't very broad or networked well. We continued into the countryside where there was a little farming, a nuclear plant smoking to our right and many deer-speckled fields. Wages in the Czech remain about 1/4 that of Austria's with very little benefits, but steadily improving. Two hours into the Czech Republic and we were pulled over for speeding and held for awhile. Quickly we are reminded of their communist background, these cops were fierce and intimidating. The police were checking fire extinguishers, tires, everything. Troudy uses this time to teach: "This is a good example of Czech Republic oppression - we are treated as criminals. Austrians would never be so rude, Austrian police are friends, not rulers." She pointed out this is one good example of why Austrians still aren't travelling into Czech very much. Also, she said, this was basically revenge because the Czech's tour buses often get pulled over in Austria because they're known for bad pollution and technical improprietries. Two-thirds of the cars going from the Czech Republic to Austria are forced to turn around due to being substandard so hostility here is strong, in addition to hundreds of years of hostility anyway. In retribution, they pull over Austrians, find something wrong and charge a fee, in our case, 100 Euros. 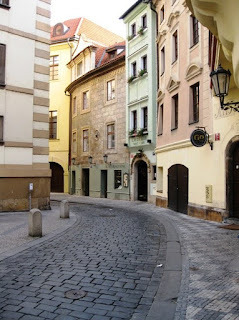 When we got into Prague, the city streets were too narrow and curvy for our big ol' tour bus. We got stuck. We had to disembark with our luggage and walk a few blocks to our motel, Betlam Club. It was a great place to stay, excellent location, excellent service. Within minutes, I donned my backpack, kissed Tom goodbye and hit the streets. Took me about 10 mintues to get over to the Old Town Square. For my notes on Old Town Square, click here. Old Town is a web of cobblestone alleys, dating back to the 11th century, in which I got a little lost a few times. It's also full of tourists. 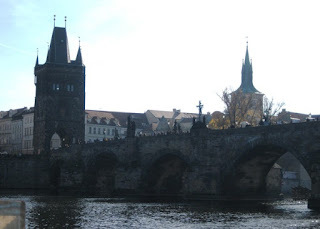 Next, I ambled over to the Charles Bridge, a Gothic 14th century bridge that connects Old Town with the castle. Local artists sell their crafts on it and local bands plays music there all day long. -The best time to be on the bridge is early morning and late evening, when it isn't packed with people. 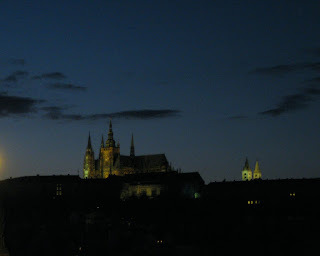 It is very romantic to be out there at sunrise and sunset and watch the lights come on at the castle. I found my way back through the cobblestone alleys, back near the Betlam Club to the Bethlehem Chapel. This chapel was founded in 1391 for sermons to be delivered in Czech. It was the largest meeting place, holding up to 3,000 people with no furniture. It became a place where ideas could be expressed, a place of scientific debate. Jan Huss became the preacher here in 1402. Huss led a rebellion against the corrupted Catholic church & was eventually burned at the stake. I remember studying about Huss back in my Christian School days and I was filled with awe at being in his chapel, walking where he walked, reading some of his sermons. Above the chapel was his living quarters. 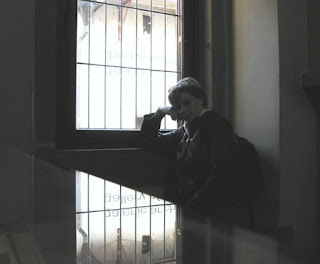 Here I am sitting in contemplation in his bedroom window seat, where, he perhaps sat in prayer 600 years ago. 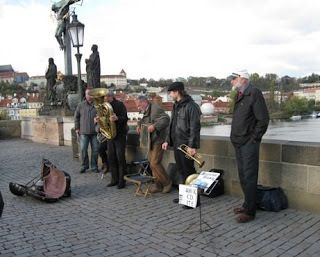 The next morning, Tom & I enjoyed the Charles Bridge at sun-up. 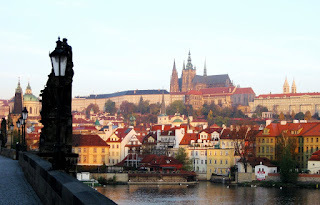 He had class-related duties and I went over the bridge and up to the Prague castle, the largest ancient castle in the world.. 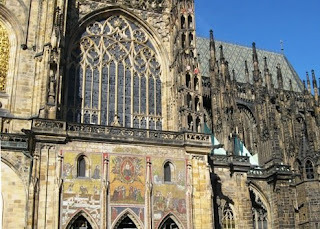 Here's a sneak peak of the St. Vitus Cathedral on the Royal Palace grounds. 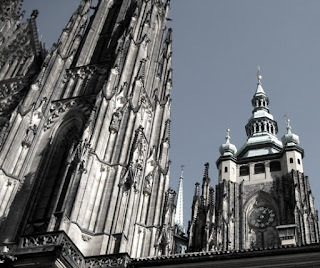 Construction on the cathedral was begun in 1344. I took an audio tour of the Cathedral and Palace and I'll share that tour and photos with you tomorrow. You look exhausted. I think I've worn you out for today. There are a couple more photos below. 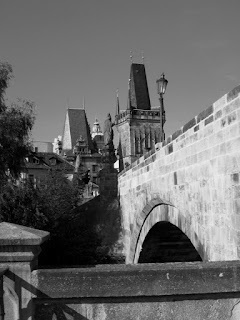 Here you can see the cathedral and palace from the Charles Bridge. And here is the same view after dark.